Dish TV TruHD Recording is done after formatting the External HDD or USD Pen Drive to Proprietary File system. It is not possible to break it, instead use other methods. The regular readers who have read our previous guides like Satellite Television and DTH Details and DTH Service Providers in India has asked whether it is possible to record the streaming or convert the recorded materials to intended format. This article on Dish TV TruHD Recording is only for India not for other countries where Dish TV provides their services. There is/are separate softwares for watching directly on PC or Mac. PC means both Microsoft Windows, BSD variants and GNU Linux as Operating System. We are not providing any crack, hack or any other way to circumvent any Copyright or DRM. What we are describing is fully legit and practical – this is the intended usage of Dish TV TruHD Recording System. The Dish TV TruHD Recording System has an opportunity – you can actually use as many USB devices you want. That simply means, you can store a full movie on one USB Pen Drive and plug it later to watch it. Probably using Micro SD slot type drive will be more cost saving option. Their only intention is to lock the recorded thing within their own system – so that the user can not distribute it in normally available video codecs. To be very honest, after paying Rs. 600.00 (around 10 USD) per month, you can not demand to collect and distribute as many movies as you want. That will eventually kill the Entertainment industry. A legal version of movie does not cost a huge now, unlike before, we can now buy only one song instead of the full album. Even if you discontinue using their service, those USD recording still works. Actually you can watch them later. The Dish TV TruHD Recording System uses a separate file system – it is not FAT or NTFS or Mac OSX Journaled. It is different format itself. 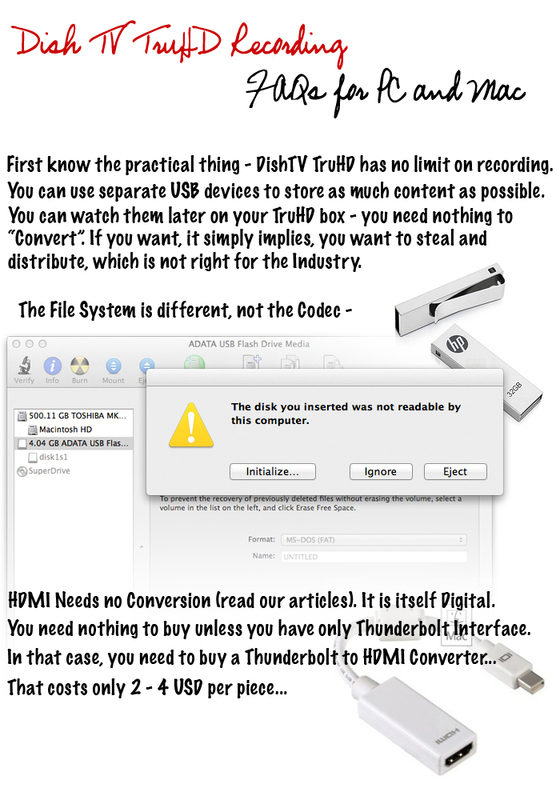 There is no question of any kind of conversion as the recorded codec even if in known format, will remain within the unknown file system. That is why you get a prompt to format whenever you insert a new USB drive. If you read our previous article – Satellite Television and DTH Details, you’ll understand that – you need no TV Tuner card to play on your computer’s display, provided that, you are using the computer’s display only. HDMI needs no conversion. In newer Macs, there is no HDMI port as we have higher quality thing named Thunderbolt interface. Obviously you can run the TV on Apple’s Thunderbolt Display using a converter – Thunderbolt Interface to HDMI Interface converter. It costs around 02.00 USD. Again, this is read only mode – the computer is not running and avoid running Television signal on computer directly (with Operating System ON via some software) although it is legit to run. The devices might not be able to control the fluctuations of signal through HDMI port, because simply they are not designed to be watched on a computer. Via USB can be more dangerous. Officially you can run your current subscription on iPad, iPhone and Android devices over the Internet. There are separate Apps. There is no app for Mac or PC at the time of writing this article. On Mac, you can use the XCode software and run the iPad device Emulator. You can install the iOS software, pay for the service and run. We have not tested, but it should work if you use a 3G Modem or LTE Modem. Because they bears a MDN number. Another way is to use virtualization to run Android OS, like we described before. It is fully legal because a guest operating system is taken as a separate entity – we need to pay license for the paid softwares even if you have paid for the same software for the host operating system. This Article Has Been Shared 8165 Times! Multimeter is a handheld electric instrument to directly measure active electrical quantities such as Voltage, Current and Resistance or has other capabilities. Cite this article as: Abhishek Ghosh, "Dish TV TruHD Recording : FAQs for PC and Mac," in The Customize Windows, November 7, 2013, April 20, 2019, https://thecustomizewindows.com/2013/11/dish-tv-truhd-recording-faqs-for-pc-and-mac/.